Would you like to scan your body's overall health in just one minute? You can do all that, without any pain, in just one minute, with the latest Quantum Resonance Technology. This body health scanner will target and lock on digestive issues, liver and kidney problems, vitamin D Levels, cardiovascular issues, vitamin, mineral and amino acid deficiencies, EMF (Electro Magnetic Frequency) sensitivity and so much more. The human body contains millions of cells but every day, millions of those cells die. In order to survive, your body splits the remaining cells in half and the cycle continues. In the process of cellular split-up and renewal, the charged bodies of nucleus and extranuclear electrons are moving and changing ceaselessly at a high speed as well, emitting electromagnetic waves without interruption. It is those signals exactly that this Quantum Analyzer picks up and it is those signals that represent the specific condition of the human body. The entire process is completed within 60 seconds, which means you can do it at the comfort of your own home, PLUS, there is no need to anxiously wait for days and days for your test results. The main analysis items are over 30, including cardiovascular and cerebrovascular condition, bone mineral density, trace elements, blood lead, rheumatism, lung and respiratory tract, nephropathy, blood sugar, stomach and intestines, liver and gall, cranial nerves, gynecology, prostate, bone disease, the trace elements of selenium, iron, zinc and calcium and a few more. Place Your Order & Safeguard Your Health Today. 2017 EHM QMRBA® FULL BODY ANALYZER: It's better to be proactive instead of reactive. 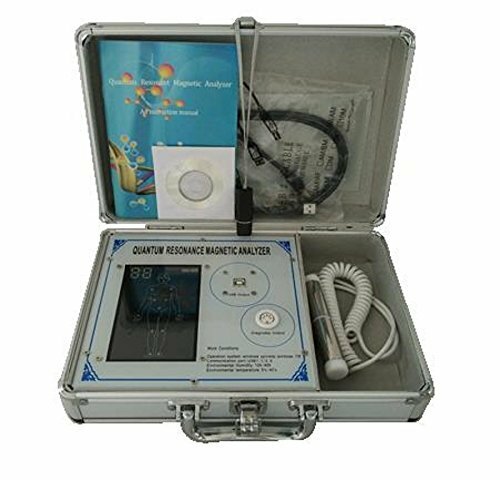 EHM 4th Gen Quantum Magnetic Resonance Body Analyzer will provide you with 48 different reports in Spanish and in English. When our health is not in good condition, our body will automatically give out certain alarms. This device will simply detect your suboptimal health so that you can start taking steps towards fixing it. SCAN YOUR HEALTH IN 60 SECONDS: This Hi-Tech Quantum Analyzer is capable of taking accurate readings of your body at a cellular level in just one minute. It's a non-invasive method that requires no hemanalysis or radiography and it's completely painless. EASY TO OPERATE: Featuring the latest software and FREE software updates, the operating system of this Quantum Analyzer is compatible with Windows 2000, VISTA and Windows 7, 8 and 10. PREDICTION WITHOUT SYMPTOMS: With only 10 or so cells of pathological change, the analyzer can capture the change pathological changes of cells and predict the precursor of disease. By taking health-care actions at this moment, you will be enabled to effectively prevent the various chronic diseases that might be putting your health at risk. STOP TREATING THE SYMPTOMS: It's time you discovered the source of your ailment and fought back with precision, instead of simply taking wild guesses. The analysis will tell you the condition of your health in just one minute. Plus, you can repeat the analysis with every member of your family and put the power of better health in your hands.